I warned you a couple of weeks ago that we were rolling into one of the those times of year when I would be “out of the office” as much as possible and that some of the activities would distract me from fishing. 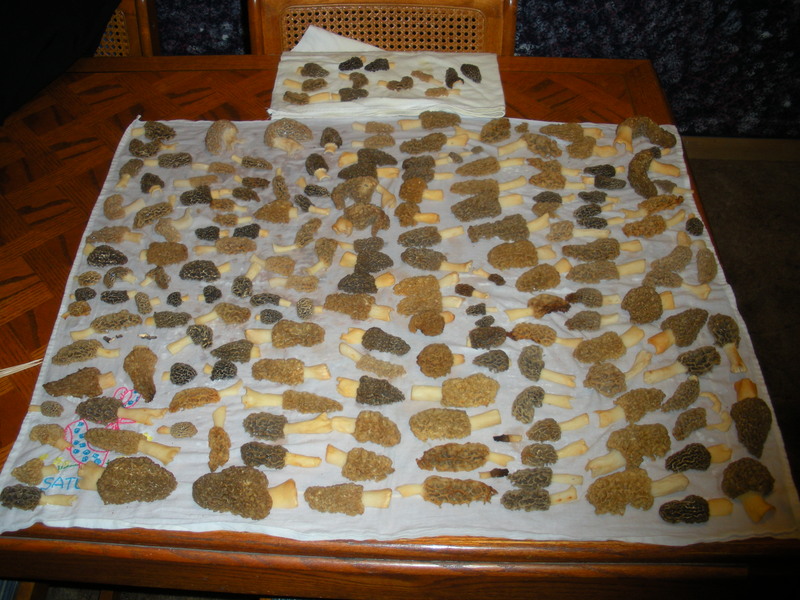 Well, one of those spring activities is picking morel mushrooms. The mushroom picking season does not last long, so when it is “on” a guy kind of has to drop other activities and get after them. My son Daniel bagged a turkey early last week and we spent the rest of the week picking morels whenever we could get out. It is actually a lot of fun, I get a little bit of a rush when I finally find a patch of them. But the best part is eating them! 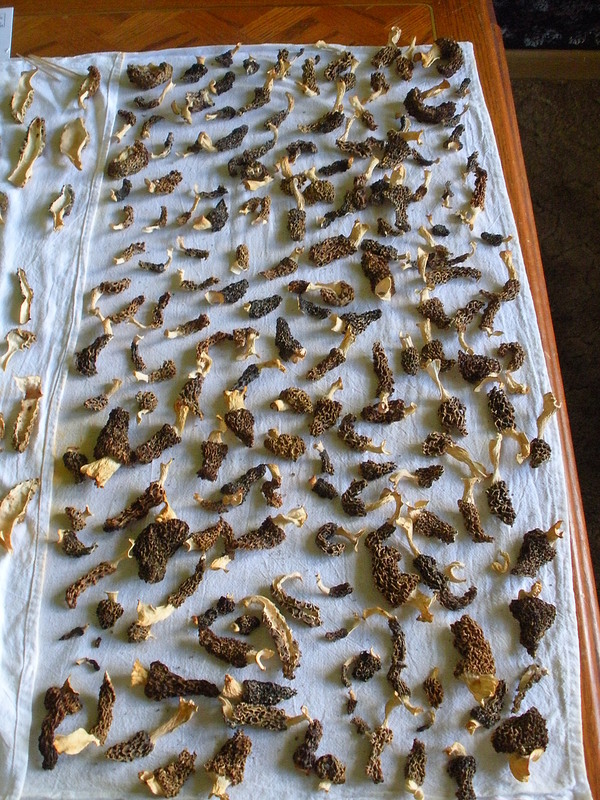 We may eat a few fresh, but we dry most of them, and then put them in the freezer in zip-lock bags and enjoy morels all year long! I like to use a knife to cut the morels off at the base, at ground level; that way I do not have a clump of dirt hanging on the morels and I leave the underground part of the fungi undisturbed. We usually carry our collection in mesh bags while in the field, but a bucket with some holes drilled in it will work well too. The holes or mesh will help keep your harvest fresh and there are those that believe it will allow you to scatter mushroom spores as you walk. Once we get home we rinse the morels in cold water, slice them in half and rinse them inside and out. 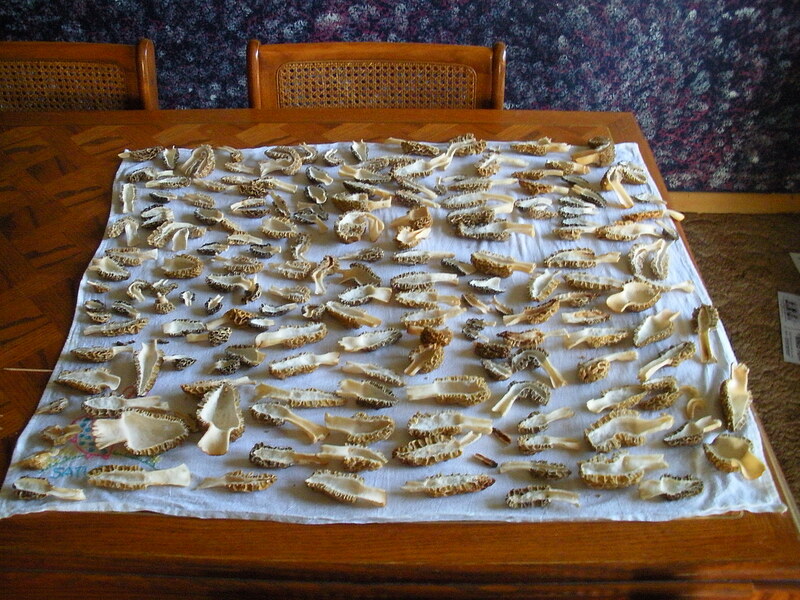 Then we place the halves on a dish towel on the kitchen table for drying. We leave the windows open and turn on the ceiling fan to keep the air circulating. After a day or so it is time to turn them. We circle around our table top full of mushrooms like a bunch of squirrels admiring their stash of nuts! Mostly it is just a waiting game, wait for them to dry, but once in awhile we will see an ant or two that we missed and remove them. It does not take long, depending on drying conditions, and they will shrivel up, completely dry. I know, when you first see this you will believe you have ruined the entire bunch, but they are fine. Once they are hard and dry we bag ’em and put ’em in the freezer. Whenever we want some ‘shrooms we take out what we want and re-hydrate them in water or milk. After a few hours of re-hydration they will be back to their original consistency and close to their original size. Most importantly, they will taste as good as ever! Emily poses with a couple of our biggest morels so far. 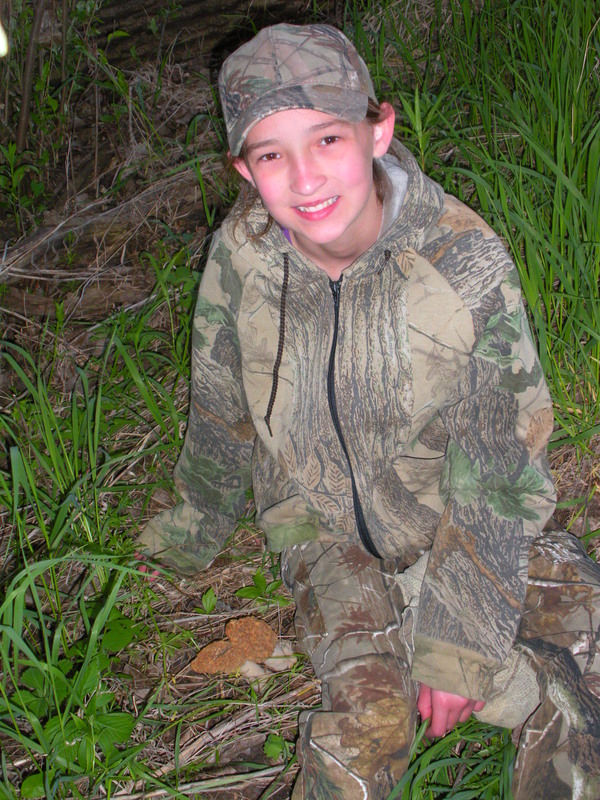 Yes, my kids and I wear camouflage while we are out hunting mushrooms. 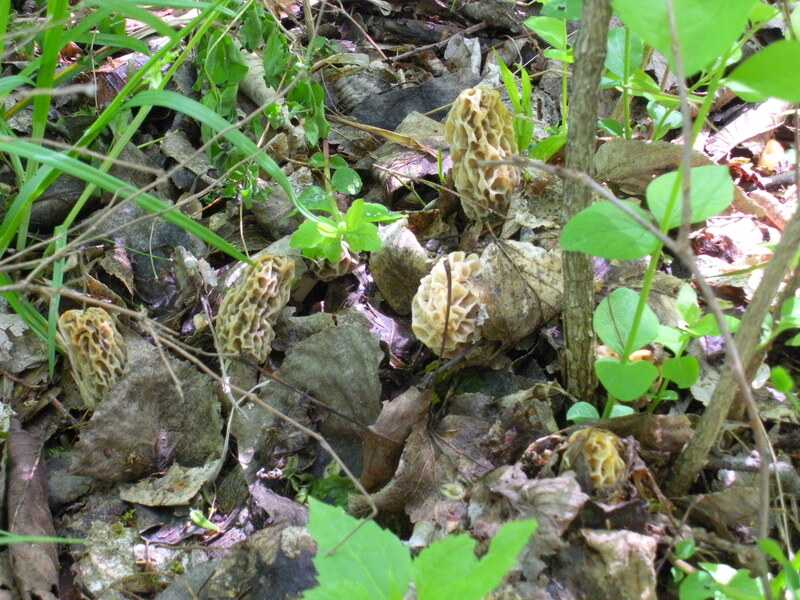 No, you do not need to sneak up on the morels; I guess I just do not feel like I belong “in the woods” if I am parading around in bright clothes and blue jeans. I also consider the fact that it is spring turkey season and I remember that we have had several hunts “derailed” by mushroom hunters bumbling about. So, we try to keep quiet, camouflaged, and above all, avoid spooking turkeys. 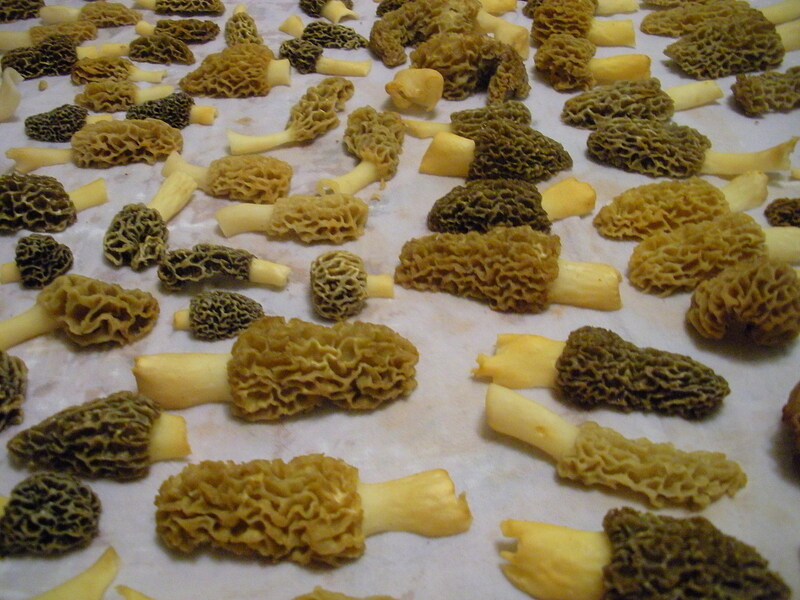 I have a theory that like snowflakes, no two morels are the same, each one is a beauty. I am conducting research on that theory this spring. If you would, send me your morels and I will report my findings back to you!